Andreas Jungherr and Pascal Jürgens (2008) ‘Modeling Small-Group Interaction on Pervasive Digital Channels: New Influence on Public Opinion’. Poster presented at the International Workshop on Challenges and Visions in the Social Sciences. Chair of Sociology, in particular of Modeling and Simulation, ETH Zurich, Switzerland on 18-23 August. In the summer of 2008 Pascal Jürgens and I presented a poster at the International Workshop on Challenges and Visions in the Social Sciences organized by Dirk Helbing, Lars-Erik Cederman, Andreas Diekmann, Frank Schweitzer and Didier Sornette. 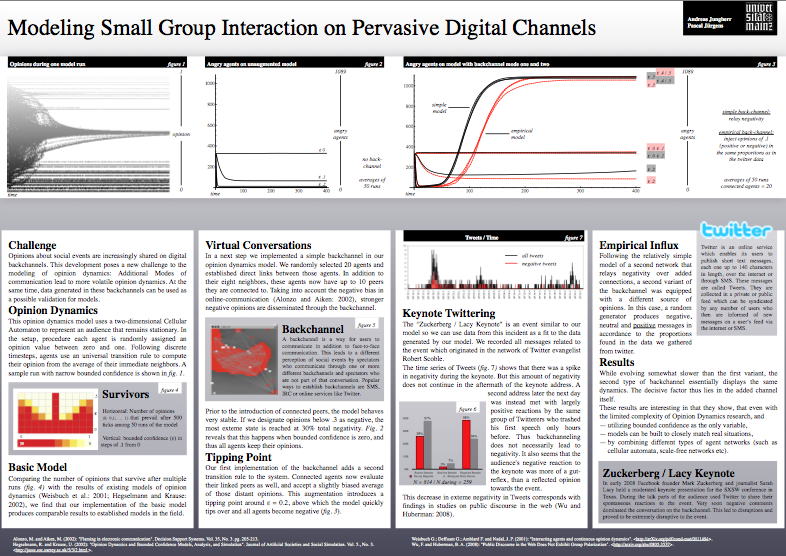 In the poster we used agent based modeling to gain some understanding into the dynamics of communication on Twitter. In the spring of 2009 we revisited this topic in a paper which Pascal Jürgens presented at the 11th General Online Research Conference, GOR 09 in Vienna, Austria. Andreas Jungherr and Pascal Jürgens (2008) ‘Modeling Small-Group Interaction on Pervasive Digital Channels: New Influence on Public Opinion’.